A stunning first novel from Shirley Hughes,one of the world's best loved children's writers and illustrators. 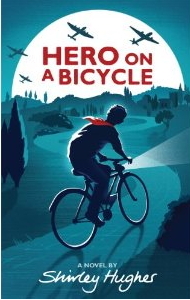 Set in the countryside, Hero on a Bicycle, close to Florence in 1944, Italy is occupied by Nazi German forces. But the Italian Resistance movement has not given up hope. In Villa Crivelli, Paolo and his sister Constanza are desperate to fight the occupation. Their father, a known Partisan and resistance fighter has had to retreat to the hills. Their mother Rosemary is British but has lived in Italy for many years. As the Nazis become increasingly worried about maintaining their position they become more and more interested in this unusual family living in the countryside, they suspect a close liaison with the resistance fighters. Shirley Hughes, is a wonderful story teller and writer. The story is focused on Paolo, a fourteen year old boy. As he rides his bicycle along the lanes to Florence he becomes more involved with the fighting and Il Volpe (...the Fox), than he had planned. The best in children's books always on line.